Every suburb needs a fruit shop like Frank’s. In original condition, as the real estate agents would say, staffed by Frank and his relatives, festooned with boxes and sacks and handwritten signs. A chef I’m related to has seen Frank early in the morning at the markets, picking over the produce, haggling, looking for the best. You can trust the fruit from Franks. He even stocks produce from local gardens, don’t buy your tomatoes anywhere else. 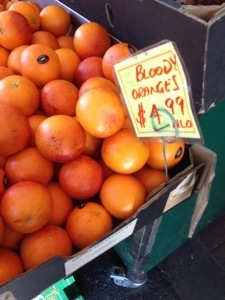 He’s just got in blood oranges. I haven’t seen them anywhere else. The kids have been eating iceblocks again and demanding new and more exotic flavours, so I thought I’d lay on them a blood orange sorbet. A quick google of recipes shows an astonishing consistency. You juice them, add a quarter of a cup of sugar to every four oranges, and then opinion diverges on treatment after that. Of course a Thermomix allows you to use the whole fruit. I used twelve oranges, zesting them first because one is a frugal housewife. 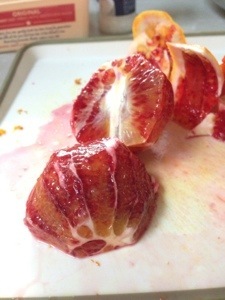 You just slice off the rind and pith (teehee, pith), cut them in half and poke out the seeds. Put those in the Thermomix jug, added three quarters of a cup of white sugar and a tablespoon of zest, just because YOLO as I’m trying to stop my kids saying. I zapped that on speed seven for about a minute. I tasted it and it was still a little fibrous, though the sugar had dissolved. Another minute made it better. Look at that colour. I poured it into a metal dish and into the freezer overnight. This morning it was rock solid. And I learnt a lesson, dear reader. If you insert your favourite Wusthoff cooking knife that you got as a wedding present twenty years ago into a bowl of frozen blood orange juice and attempt to leverage out a chunk, you will snap off the tip. This will cause you to stand aghast for several minutes, wondering where all the air in the room went. My favourite knife. What I should have done, and subsequently did, was to run the knife under hot water, jam it in the ice and wiggle it to the bottom in several places until it starts breaking up. It wouldn’t have killed me to let it soften for a few minutes either. I got the chunks back in the Thermomix and very cautiously turned it on at a slow speed. The idea is to break up the ice crystals. 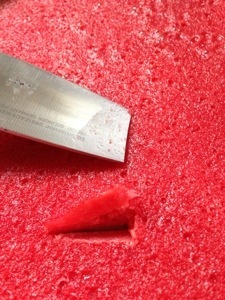 The smaller the ice crystals, the smoother the consistency. You can achieve small ice crystals by freezing the stuff really quickly like they did the last time I watched Mastchef some years ago with a flash freezer. 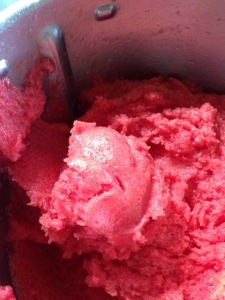 Or you can churn it while frozen, like you do in an icecream maker. The Thermomix did a fair job (two minutes at speed four with a lot of poking with the spatula through the lid) but it might have been better if I’d let it soften some more. Or if I’d put a few egg whites in the initial mix. You could serve it at this point. 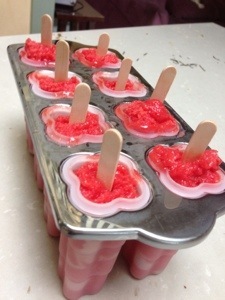 I spooned it into iceblock moulds, the kids prefer to eat it that way. The Moose happened to be around, he had a late start due to having to be in town at 10.30 for a giant music rehearsal today. I gave him a taste. He pulled a face. “Ooh, it’s a bit sour,” he opined. “It isn’t strawberry, it’s blood orange.” “Oh, in that case it’s great. Can I have some more?”. It’s all in the marketing. 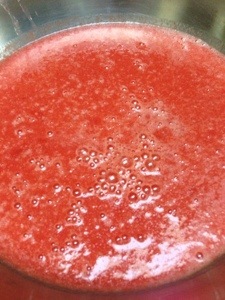 To avoid snapping knives or scratching steal bowls in the future you could either freeze the peeled and deseeded fruit then blend with egg white and sugar or make the syrup and freeze in ice cube trays so they are ready to be thrown straight back into the Thermomix for sorbet churning (with an egg white – makes it fluffy).